Butter my Kitchen: Oh, Stuff it! I love the flavor of green peppers when I cook, but I can't eat them-just say it is not pretty. I am now fumbling around, trying to figure out how to feed us all now that we are working different shifts and are rarely in the same place at the same time. I had some easy things planned for my lunches at work as we were being fed at work 3 days in a row because of the mandatory overtime we all had to put in. Dude suffered a little because I was so exhausted when I came home from my ten hours of training each day, the last thing I wanted to do was lift a frying pan. The grocery store had some decent looking peppers on sale 2/$1, so I picked up 2, got some fresh ground sirloin and mixed in some staples from the pantry and turned out some pretty rocking peppers! Bring a saucepan (I used 3 quart) of water to a boil. You need enough to have the peppers submerged. Carefully lower the peppers into the boiling water, cover, and let boil 4 minutes. Turn off heat and remove peppers. Place upside down on a paper-towel lined plate to drain. In a skillet, brown the ground beef, onions and garlic. 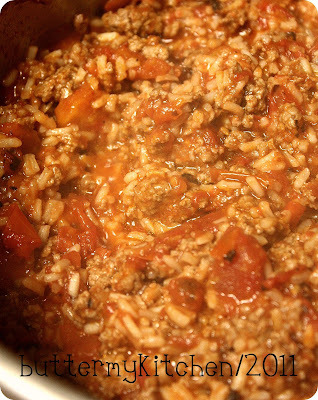 Stir in rice and stir it around for a minute or two, then add water and the can of roasted tomatoes. Bring to a simmer and let bubble away for about 5 minutes, just so all the flavors can meld. Stir in the cheese and turn off heat. Place drained peppers in a pan that will allow them to stand upright. I used a loaf pan. Spoon filling into each pepper. Bake in a 350 degree oven for 20 to 25 minutes. He was a very happy boy. Especially since he didn't have to eat from the "Wheel of Death" for a third night in a row. You go girl.. they look wonderful ..and you just threw them together, fantastic. They look delicious and they are one of my favorite meals. Mine are very similar to yours. Use just about the same ingredients! 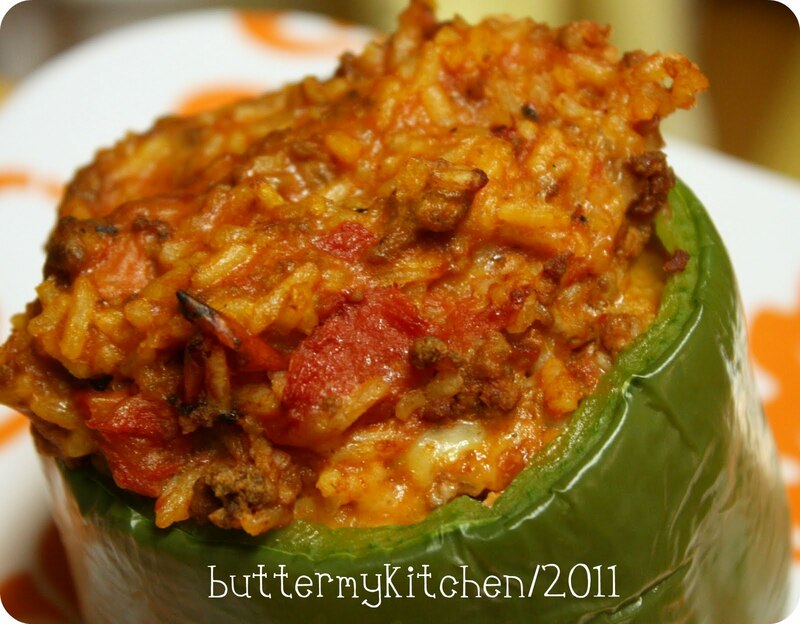 Stuffed Peppers are one of those comfort foods that always reminds me of my childhood. Lately, when I've been making them, I have been using couscous and ground chicken and they are soooo good. I never knew to boil them first. Might have to try it that way. Lys-it just softens the peppers. My Mom just stuffed them un-boiled, but he likes them softened. I am with you..not a big fan. my Mom used to make them ALLLLL the time. I'm not a fan of peppers either, but that stuffings looks really good! I dont like them either (I hate green peppers), but when I made them with Red Peppers they were much better! Looks like you have had some changes going on around your Casa, hopefully all for the good! My mother used to make this all the time when we were kids. My sister and I simply hate peppers so mom would just make us a dish of the filling...that we loved. I make mine using red, orange, and yellow peppers - they are tastier than green. I love the filling you used...the peppers look delicious. I found your blob wandering around and wanted to say hi. 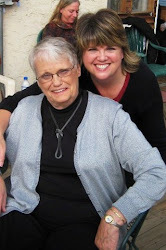 It sounds like you might like my Sunday slow cooker segments. It is so nice to have a home cooked meal ready and waiting when you get home from long day. 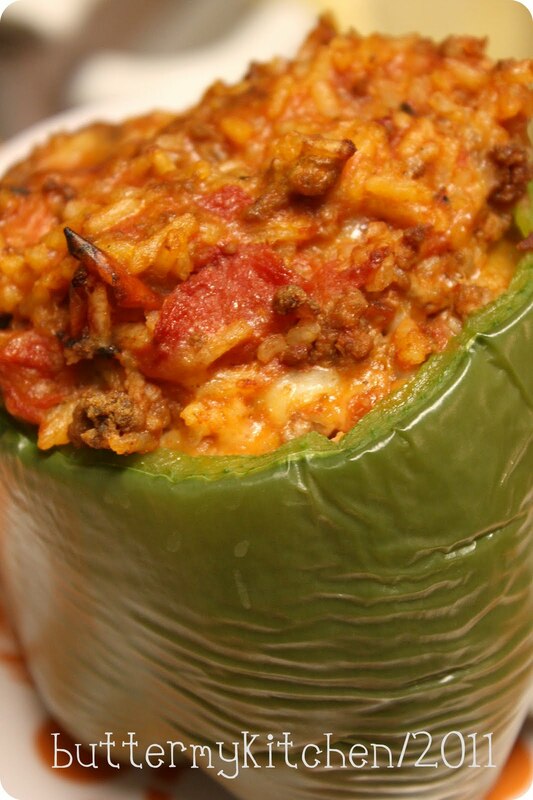 Stuffed green pepper is one I am planning on making soon too. Your look delicious! i've never gotten too excited about stuffed peppers myself, but then again, the filling has never looked as appetizing as this one. good on you, tamilyn! I'm with you on the stuffed green peppers (but not for the same reason); however, like your Dude, my Dude loves them too - so I make them. I love the idea of using a loaf pan for two. Genius! I usually use my square and make 4 just so that two won't fall over. Thanks for the tip! Nicely done! 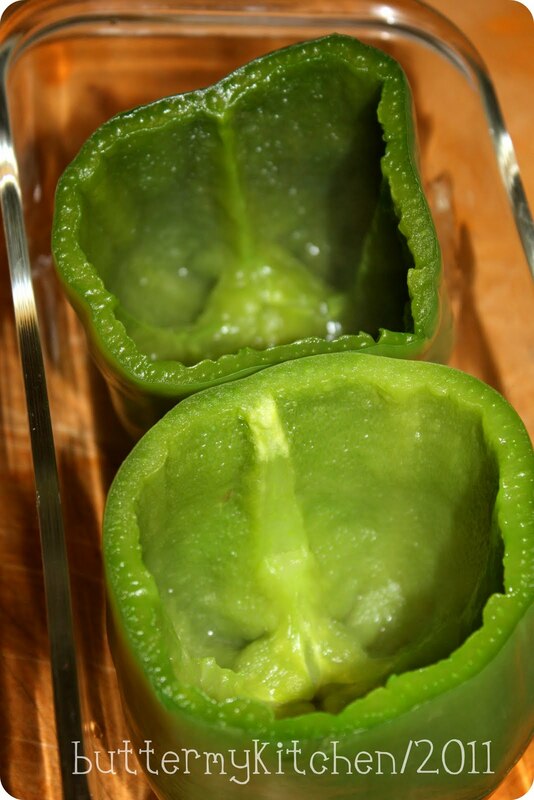 I'm not big on green peppers but I would make this fabulous filling and put it in red or yellow peppers! Thanks for the recipe. Hey! I just made these too!!! I should be typing it up... but I'm sitting here reading blogs, which I haven't done in a gazillion years!! Looks like a perfect warm dinner for a cold night!